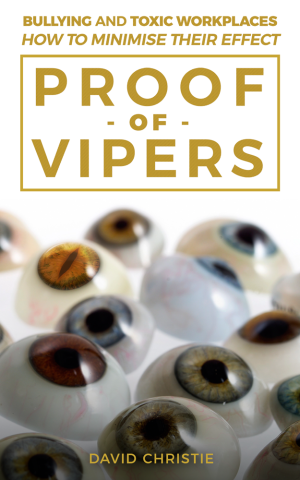 Proof of Vipers is a book about how to be happier in your life, and in particular, your work life. It is modest sized book, accessible, brief and succinct; designed specifically for readers who may not be keen on absorbing large quantities of academic work. The author, David Christie is a subject matter expert on human behaviour, having a Human Resource practitioner background with over 25 years’ commercial experience. The concept of the book was conceived after many years of working with clients and contacts whose behaviour seemed occasionally to be at odds with productivity, efficiency, and humane behaviour in general. Proof of Vipers is designed to gift the viewer with the tools and knowledge to help you to realise that there probably is nothing wrong with you, and that not all the behaviours encountered at the workplace are appropriate in terms of compassion or efficiency. This book has a primary purpose-to liberate and enlighten through education. Contributions from individuals who have summoned the courage to share their experiences weave through the book in story and direct quotations, though their identities have been masked. Many interviews were conducted and similar themes were woven into the thread of the stories, which share a common anguish. What the author has chosen as a descriptor is the word Machiavellian for a good all-round label, despite maligning poor Niccolò Machiavelli. For brevity’s sake, they’ll be referred to as “High Machs” and “Low Machs.” The former refers to a highly effective, toxic, or energetic Machiavellian individual. Don’t try too hard-rely on the facts of the case, not the distractions of drama. Do not invest emotionally in the outcome. Trust your senses. When a little lie does not fit well with you follow your hunch-trust in your internal nudges. Use the Scientific Method for assessment. If it’s too good to be true, then it probably is not. Is there just too much “costume” and back story? Are they trying too hard to befriend you and/or your group? Funny bones-is their sense of humour acerbic, off, dark, misogynistic or cruel, and designed to shock? Why do employees stay when they experience bullying? A confluence of reasons exist. Shame is a timeless favourite. For other victims, it never occurs for them to leave, often for reasons of low self-esteem. Family and monetary pressures also come into play, often making it seem insurmountably difficult. Bullies somehow know this. As with the intimate partner violence, the bullied employee gets a powerful feeling of overwhelming relief when the incident is over. And one can become addicted to that feeling. Our bully, then, is the only person who can deliver these moments of serenity. Thus, the bully holds a key to the employee’s feeling of well-being. The victim lives in hope that this will end shortly. ‘Unreasonable work expectations’ seem to be a perennial favourite, and easily matched with a willing, guilt-oriented worker. There is an inference that one needs to work extraordinary hours for the large remuneration that is extended as largesse rather than just reward for a lifetime of professional commitment. A smart workplace is not a workplace that has workers who are desperately tired, snatching meals in between phone calls, and working extended hours on and off the mobile communication freeway of the modern world.